For fifteen years now the so-called Trauermarsch [‘funeral’ march] has been held to commemorate the bombing of the City of Dresden on the 13 and 14 February 1945. In 1998 there were probably no more than thirty local Nazis (from Dresden and the surrounding area) who tried, as a group, to join the march to the Frauenkirche [Church of Our Lady] carrying flowers and candles in their hands and thus participating in this annual commemorative ritual. Since then the overall numbers have increased to the point where last year there were up to 7,000 participants. And it is not just the number of participating Nazis that has risen enormously, the significance of the event for the Nazi scene itself changed, generating a power struggle about control of the meaning and organisation of 13 February within the scene. Why is Dresden so attractive to Nazi circles and what is it that allowed this event to develop into what has become their biggest procession in Europe? We will address this problem first, before presenting a chronological overview of the development. For German Nazis (across the whole spectrum) Dresden stands for two things: German identity as victims and allied war crimes. This means that Dresden offers certain core meanings for neo-Nazi ideology. Dresden is ‘like the destruction of numerous other German cities, the product of a war carried out against our people to implement economic and political polices’.1 ‘German’ is used here in the way it is pervasively employed in Nazi ideology viz, to mean ethnic German nationalism. This ethnic nationalism [Völkische Identität] is conjured up if ‘commemoration and memorialisation’ is declared to be ‘an important cornerstone of the peoples’ soul’2 and the bombing reframed as an ‘allied enterprise for mass extermination’3 motivated by ‘eliminatory anti-Germanism’.4 What is being constructed here is the notion that the German community is a community of victims that is under threat of extermination solely on the grounds of their Germanness.5 In this context the choice of terminology that had previously been reserved for the Shoah alone is quite intentional. Those who met their deaths in the bombing of German cities are equated with the victims of the industrial extermination under the National Socialists. In the next breath the demand is made for an appropriate memorialisation of ‘our own victims’ and––with anti-Semitic connotations––the end of the imposed ‘thraldom of guilt’. At the same time the allies are ascribed an identity as the sole perpetrators whose ‘war crimes’ which are still not ‘expiated’. For the scene this line stretches unbroken from the past to the present. The ‘same people who had no scruples about killing thousands upon thousands of civilians in cold blood lack scruples today too. The trail that runs through the twentieth century––from Dresden via Koreato Vietnam and Baghdad––cannot be blamed on the Germans even with the malicious and perfidious character they have’.6 The image of the enemy is sharply focused here – the anti-American posture ascribes the unequivocal perpetrator role to the ‘world policeman’ USA and contrasts it with one’s own role as a victim. The importance that Dresden has for the Nazi scene can thus be explained by the role that the events of 13 and 14 February have in the construction of an ethnic nationalist identity, for the self-stylisation as victim and for the construction of an image of the enemy. But why Dresden specifically? Why not Cologne or Hamburg? It seems that Dresden was the perfect symbol for all of this right from the beginning. Immediately after the bombing certain myths gained circulation and many continue to play a role right up to the present: Dresden as an innocent, undefended city lacking significant military targets, a senseless attack so close to the end of the war and completely exaggerated estimates (300,000) of the number of deaths. It was, furthermore, precisely these myths which offered linkages to bourgeois mind sets in Dresden. This way of reading the bombings has also dominated the historical narrative for decades. Even today self-stylisation as a victim (as with the Nazis) is in evidence in many commemoration ceremonies. However, in most cases a rejection of National Socialism is also articulated and a call made for reconciliation instead of revenge. The climax of Nazi––historically revisionist––remembrance is the annual Trauermarsch in Dresden which has developed from the attempt of a few dozen Nazis to taking part into the most important Nazi procession in Europe. While the numbers of participant have decreased in the last two years as a result massive protests and blockades, this does not change the Nazis’ claim to act as the trustees of the memorialisation of Dresden. After an unauthorised Trauermarsch to the Frauenkirche in 1998 was brought to a halt by police before reaching its destination, it was decided to take another tack. ‘That year saw the birth of the idea for a commemorative march that was intended to grow bigger and bigger;’ it says at the conclusion of the Nazi report on the events of the evening of the 13 February 1998.7 Consequently the first authorised march commemorating the anniversary of the Dresden bombings took place in 1999. The Junge Landsmannschaft Ostpreußen (JLO) [The East Prussian Territory Youth Association] was registered with the city as the organisers. And so, on the evening of the 13 February 1999, 150 (mainly young) Nazis assembled at the main railway station and marched along Prager Straße to a remembrance ceremony at the Frauenkirche. Having arrived there they marched in a double column through the grieving citizens of Dresden, affixed their wreath to the construction site fence surrounding the Frauenkirche––it was in the throes of being reconstructed––and lit candles. The leaflets handed out by the Nazis in which there was talk of ‘250,000 dead’, ‘genocide’ and ‘the greatest annihilating attack of all time’ were more often received by the citizens with approval rather than criticism. The series of annual marches continued and did, in fact, grow in size. In 2000, five hundred Nazis took part in the annual night-time Trauermarsch organised by the JLO and NPD [German National Democratic Party]. Amongst them were, for example, Franz Schönhuber and Horst Mahler who were prominent in the Nazi scene and receiving country-wide attention for the first time. It was the Silesian Territorial Associations––Upper and Lower––and the Saxony/Silesian Lausitz Association that sent out the summons to Dresden in 2001 under the motto ‘honouring the victims of the bombing terror’. Just under 800 Nazis of various shades and stripes arrived: Vertriebenenverbände [Expelled Persons Associations] wearing traditional costumes and bearing flags, members of the NPD and Freie Kameradschaften [neo-Nazi groups]. In the succeeding two years upwards of 1000 old and new Nazis took part in the Trauermarsch parades ‘to commemorate the victims of the bombing holocaust’8. Year after year, they marched through the centre of Dresden on the evening of the 13 February with torches, candles, flags of former German territories and banners on which ‘Bombing Terror’ and ‘It wasn’t war – it was murder’ could be read. Only a few hundred meters away citizens of Dresden were lighting candles at the Frauenkirche and memorialising the vicitms of the ‘bombing terror of the 13 and 14 February 1945’9. They, too, became part of the scenery whether intentionally or otherwise. The tradition of demonstrating on the evening of the 13 February was first broken in 2004. The JLO had established itself as the event organiser and saw an opportunity to increase the numbers of those participating and as a consequence, its own effective position inside the scene. From now on the ‘Trauermarsch’ was to be held on a Saturday close to the 13 February date. In the event some 2,100 Nazis representing the full spectrum of groupings from all parts of the country took part in the march on 14 February. However, just under 200 Nazis––mostly from Dresden itself––held to the tradition of the evening march on the 13 February. Only then was the commemoration ‘authentic’. The JLO accused them of undertaking an ‘attempt to politicise’ the event – too many people talked for too long there but failed to talk about the real significance of the occasion. The rift deepened the following year. NPD members were elected to the Saxony State Parliament and in January of 2005 Jürgen W. Gansel caused a scandal with his ‘bombing holocaust’ speech there during a commemorative event for the victims of National Socialism. Holger Apfel, chairman of the parliamentary group, now took on the patronage of the march and the NPD staged the 13 February in keeping with their politics of a ‘right-wing people’s front’. The unity of right wing groups was to be projected outwards, something which was particularly resented by independent groups who felt that they had been co-opted by the NPD and the DVU [Deutsche Volksunion (German Peoples Union)]. The limitations of a ‘right-wing people’s front’––the attempt to establish a common modus operandi among the ‘nationalist opposition’ independent of the form of organisation, type of action involved or ideological differences––has seldom been made as clear as it was that day. Nevertheless, the ‘Trauermarsch’ on 13 February 2005 was one of the biggest Nazi marches in post-war history: that Sunday 6,500 Nazis came to Dresden. This successful mobilisation was supposed to be bettered in 2006. Even though there was a large turnout for the march––4,700 took part––that year conspicuously fewer Nazis came to Dresden than the previous year. In addition, for the first time, a counter protest10 had an effect on the march: around 800 people successfully blocked the Nazi’s route. As the organiser, the JLO’s indecision during the blockade caused the latent conflict between the ‘independents’ and the JLO and NPD to flare up in earnest. Militant Nazis from the Freier Kameradschaften end of the spectrum tried to break through the police cordon in order to continue the demonstration. They totally misjudged the situation. Accusations were then levelled at the NPD and JLO for their lack of support and ‘cowardly’ behaviour towards the police. Even before the actual event around 800 Nazis from the spectrum of the Freien Kräfte Sachsens, Sachsen-Anhalt [Saxony, Saxony Anhalt] and Berlin––in what amounted to a demonstration of power––marched through Dresden to the JLO designated meeting point. The question as to the proper time for a Trauermarsch became a central issue of the discussion and thus, at first glance, a debate about quality vs. quantity. The alliance (it is still active) presents itself as a broad-based, inclusive association. In keeping with that aim, there are not only members from the dominant Freien Kräften but also adherents of the Nationalen Bündnis für Dresden e. V. [National Confederation for Dresden]––now amalgamated with the regional NPD––along with isolated members of the Junge Nationaldemokraten [Young National Democrats], the NPD itself and private individuals. In the end the Aktionsbündnis succeeded in winning the debate against the smaller organisations, the JLO and the NPD. Thus 2007 saw a march on one day only, during the week, for the first time since 2003. That had a significant effect: noticeably fewer people found their way to Dresden and the event took place with 1,600 to 1,800 participants. Furthermore, the AgV was not able to live up to its aim of holding a ‘dignified remembrance ceremony’ either. It was almost impossible to think about a quiet remembrance considering the continuous anti-fascist protest that went on. In addition the march was both visually and substantially dominated by the NPD. On the one hand this was because the police confiscated the AgV banners and, on the other, because the NPD had not only headed the demonstration but also provided most of the speakers. Thus the AvG has to exercise self-critique and admit that ‘during the Trauermarsch on the 13 February the Aktionsbündnis was unable to make a significant impact’.13 But at least the power struggle between the Freien Kräften [independent groups] on one side and the JLO and NPD on the other was settled: The Aktionsbündnis gegen das Vergessen had established itself and prevailed. In 2008 the war of attrition ultimately led to a break. Every year since then there have been two marches. One on the 13 February and a large scale march at the weekend. This was caused by, on the one hand, the evaluation of the previous year as a failure with too few participants and too little protest and, on the other, the insistence of the AvG on its demand to commemorate the victims of the attack on Dresden ‘with a huge Trauermarsch on the 13 February itself’ because it represents ‘the standpoint that particular dates such as the Volkstrauertag [National Mourning Day] of the 8 May or the case in point, the 13 February, are of elementary significance for us as a people, i.e. as a Schicksalsgemeinschaft [community of common destiny] that has biologically grown together’.15 And thus about 1,000 Nazis mainly from the regional, Freien Kräfte groups marched on the 13 February and about 4,500 Nazis from across the whole spectrum of the German right-wing marched on the 16 February. The attraction of the AvG march during the week for the militant Nazi scene also drew some of its power from its self-staging as a National Socialist march: once again, in 2009, some 1,100 ‘independents’ marched through the streets with torches, drums, black flags in skeleton costumes and crosses accompanied by Wagner music. In Wettiner Platz, the scene of the Dresdner book burning on the 8 March 1933, they held an interim torch-lit rally. The following Saturday 7,000 Nazis from Germany and the rest of Europe streamed into Dresden. The effect of the 13 February at the European level became absolutely clear. 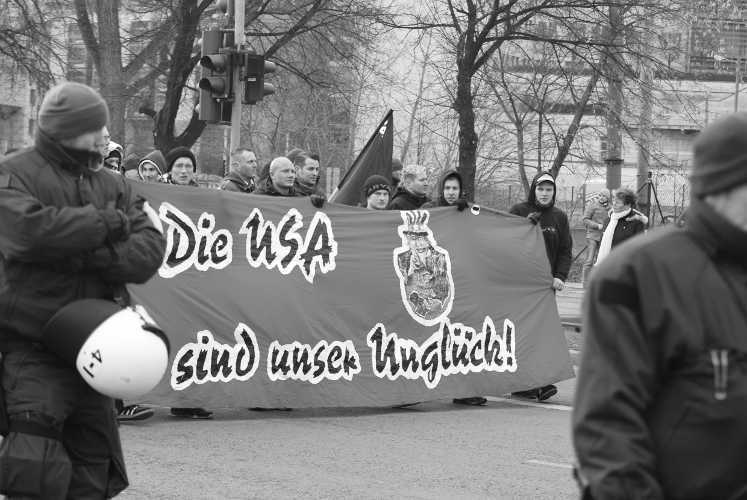 In 2010 the 13 February fell on a Saturday and 6,500 Nazis travelled to Dresden. However, due to massive protests only about 1,000 of them reached the assembly point at the Neustadt railway station.16 Several thousand gathered together on the outskirts of the city and started off for the meeting point several kilometres away led by the old-established NPD and Kameradschaft organisations. The confusing and disorganised situation finally forced the police to prohibit the march and halt the neo-Nazis. 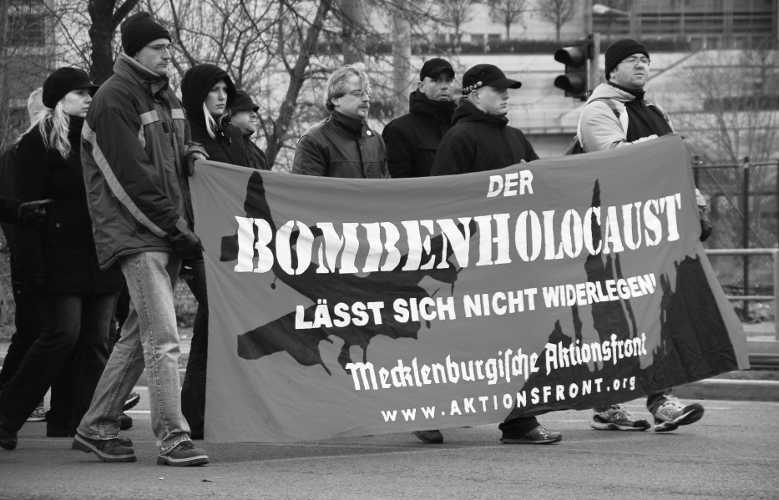 The following year, 2011, the Aktionsbündnis was able to boast of an increase in attendance by Nazis to 2,000 but the route of their march was significantly reduced because of sit-down blockades. The bigger march on the 19 February was again impeded by protests. In any case only about 3,000 Nazis travelled to Dresden in the first place. After the fiasco of 2010 the scene tried to modify their concept but in fact failed miserably. Even though three different starting points were registered with the intention of dividing the impact of the counter protests, only one of them was able to be reached by a few Nazis. Those who had come by bus diverted to the suburbs and again attempted to use the concept of a ‘march on the city’ which they had used the previous year. This they expanded to include a ‘finger concept’. Starting from Freital, 2,000 Nazis, organised in ‘colour-coded’ groups, managed to gather in south Dresden in the late afternoon by using various routes, only to depart for home almost immediately.17 The last 13 February to date––held in 2012––was a disaster for the Nazis too. The JLO failed in the organisation and had to cancel at short notice what had been planned as a large scale march. For the torchlight march of the Aktionsbündnis about 1,500 participants came but were only able to carry out a quick run ‘round the block’. And even this was repeatedly interrupted. Protests also prevented the intended demonstration. Afterwards criticism poured down. Frustration gave rise to talk of the ‘cheek of being on the streets for 1½ hours and marching one kilometre’, there were too few stewards and they were incompetent, the discipline during the march was unworthy of the name, the police omnipresent and travelling during the week complicated. The list was long, the debate heated. However, one thing became clear from all of this –– apparently the Saxony scene was now unable to create the conditions necessary for a big march as has been the rule just a few years ago. And that was mainly because they were unable to cope with the massive protests. But it would be false to talk of the end of the conflicted issue of 13 February for the Nazi scene. a tendency to establish the 13 February as an ‘action day’ throughout the German Republic. Citation Antifa Recherche Team Dresden: Dresden calls. How one of the biggest European Nazi parades came to be, in: Abolish Commemoration – A Critique of the Discourse relating to the Bombing of Dresden in 1945, online at http://www.abolishcommemoration.org/ART1.html [accessed dd.mm.yyyy]. 1 Aktionsbündnis gegen das Vergessen, ‘Nacht zieht über Dresden’ dated 08 Oct. 2008; web.archive.org/web/20090226222935/http://freie-offensive.net/agdv/index.php?seite=aktuelles&aktuelles=2008_10_08-1 (accessed 01 Sept. 2012). 2 Aktionsbündnis gegen das Vergessen, ‘Die Toten mahnen uns! – Ihr Opfer ist unser Auftrag!’ dated 25 Oct. 2008; web.archive.org/web/20090226222941/http://freie-offensive.net/agdv/index.php?seite=aktuelles&aktuelles=2008_10_25-1 (accessed 01 Sept. 2012). 3 Lausitz-Infos, ‘Der Bombenterror gegen Deutschland’; web.archive.org/web/20091003220338/http://freie-offensive.net/agdv/index.php?seite=aktuelles&aktuelles=bombenterror (accessed 01 Sept. 2012). 4 Jürgen Gansel in the provincial government session of 21 Jan. 2005, Sächsischer Landtag: Plenarprotokoll 4/8, p. 463. 5 See: Alexander Kleber: ‘Den Geschichtsklitterern entgegentreten’, National Zeitung, 08 Mar. 2005. 6 Holger Apfel in the provincial government session of 21 Jan. 2005, Sächsischer Landtag: Plenarprotokoll 4/8, p. 461. 7 ‘Etwa 100 Jugendliche am Trauern gehindert’, auf: http://massenmord.narod.ru/ (accessed 30 Aug. 2012). 8 See: ‘Aufruf der JLO zum sogenannten Trauermarsch am 13. Februar 2002’. 9 See: the general ruling issued by the City of Dresden in 2002. From that date on the City of Dresden prohibits all assemblies on the 13 February in the city centre between noon and midnight year after year by means of a general ruling. 10 See also: Chronologie der Proteste in this publication. 11 Talking to the magazine Hier & Jetzt on 18 Dec. 2006; web.archive.org/web/20081228004838/http://freie-offensive.net/agdv/index.php?seite=aktuelles&aktuelles=2006_12_18-1 (accessed 01 Sept. 2012). 13 ‘Nachbetrachtung “Aktionswoche 13. Februar”’ dated 05 Mar. 2007, at: web.archive.org/web/20081228003835/http://freie-offensive.net/agdv/index.php?seite=aktuelles&aktuelles=2007_03_05-1 (accessed 01 Sept. 2012). 14 About us at: www.gedenkmarsch.de/dresden/wir-uber-uns (accessed 30 Aug. 2012). 15 ‘Aktionsbündnis gegen das Vergessen zum 13. Februar 2008’; www.infoportal24.org/index.php/menue/24/thema/69/id/5707/anzeigemonat/12/akat/1/anzeigejahr/2007/infotext/Aktionsbuendnis_gegen_das_Vergessen_zum_13.Februar_2008/Archiv.html (accessed 01 Sept. 2012). 16 The meeting point was shifted at short notice by the city authorities from the main railway station because numerous officially authorised demonstrations had been registered all round the building. 17 Cf. Antifa Rechercheteam Dresden, ‘Lose Finger sind keine Faust’, Review, 18, spring 2011, at: venceremos.sytes.net/artdd/reviews/review_18/lose-finger-sind-keine-faust.html (accessed 01 Nov. 2012). 18 See: web.archive.org/web/20070808071050/http://www.aktionsbuendnis-gdv.de/index.php?seite=aktionswoche&aktionswoche=start (accessed 01 Sept 2012). 19 Aktionsbündnis gegen das Vergessen, ‘Ein Licht für Dresden’; web.archive.org/web/20070206064413/http://www.aktionsbuendnis-gdv.de/index.php?seite=ein_licht (accessed 01 Sept. 2012).